Heh... exactly what I did the first time I met her. OMG! ROTFL. That's so cruel... but so funny. Oh god. The extreme ends of offense and hilarity are tugging at my heartstrings. This will be a losing battle in my head. Why do you want to keep him? I probably shouldn't discuss this in a message forum. I think you should let her. I will comfort his poor wife in the meantime. 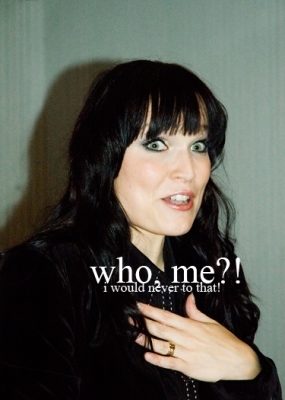 yes, Naiad can have Marcelo, and Tosca and i can comfort Tarja. Can I comfort Tarja too? @Almagest In a good or bad way? ROFL! To think I never noticed the resemblance before. The comparison is not new actually, but the execution is priceless. Oh, I thought this was a 'new' comparison! I noticed that some time ago, but I just shared with some friends! I thought 10 times before posting here btw! Gosh!! They are just hilarious!!! We should compile them all and print them so somebody can show it to her next time you see her!